Sleep experts advise you to plan ahead for the change to daylight saving time on Sunday, March 11, when most of the U.S. will “spring forward” by one hour at 2 a.m.
“You should plan your new sleep schedule to allow time for your body to adjust,” said American Academy of Sleep Medicine spokesperson Dr. Lawrence Epstein. 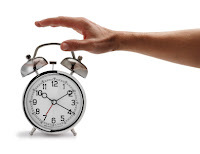 The AASM recommends that you go to bed 15 or 20 minutes earlier each night before the time change. This will help ease your body into the new schedule. On the night of the time change, set your clocks ahead one hour during the early part of the evening. Then go to sleep at your normal bedtime. Changing other routines also may help your body clock adjust. For example you may want to eat dinner an hour earlier than normal. According to the AASM, failing to make adjustments for the sudden time change can have a negative effect on your body. In addition to losing an hour of sleep, the timing of your body clock can be disrupted. This may cause you to feel more restless at night. These problems all can contribute to an increase in daytime sleepiness. The AASM advises you to take precautions if the time change makes you feel sleepy. Try to keep a light schedule of activities and avoid drowsy driving. AASM spokesperson Dr. Ron Kramer says that the negative effects of the time change can persist for days. “This problem, surprisingly, can last as long as one to two weeks in some people, especially in the ‘night-owl’ type of person,” said Kramer. “Night owls” or “evening types” are people who have a natural tendency to stay up later at night. This puts them at risk for delayed sleep phase disorder, which occurs when their usual bedtime and wake time are much later than the social norms. Since night owls have a hard time falling asleep when they go to bed early, they may be unable to compensate for the time change. As a result they may go to bed even later than normal, depriving themselves of needed sleep. A study published in the online journal BMC Physiology on Feb. 12, 2008, confirms that the transition into daylight saving time can enhance restlessness at night, especially in night owls. People who are “morning types” are more likely to be restless after the return to standard time. The U.S. returns to standard time on the first Sunday each November, which will be Nov. 4 in 2012. Kramer advises you to seek help if you have an ongoing sleep problem or regularly struggle to stay awake during the day. Ignoring the problem could put your health at risk. Studies have linked sleep disorders to other health problems such as depression, obesity, heart disease and diabetes. Visit www.sleepcenters.org to find an AASM-accredited sleep center near you.